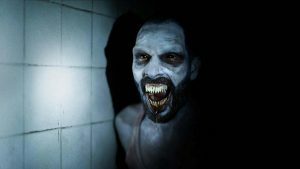 The opening few minutes of Netflix GHOUL is yet another Indian story that unleashes bravest film-making you can see this year. In fact, the entire beginning episode of the series shows overflow of confrontational carelessness that means the series has got qualities that will definitely gain praises. The opening slot informs viewers about the show’s theme and what can be expected from it in future where the country has been destroyed and divided by sectarianism. All people opposing government are sent to military detention centers that have been shown so far. If the category is horror, it needs to play in the dark and the Director Patrick Graham has ensured that following series of Ghoul will be shown in almost dark. Not only does the director create suitable grounds for this supernatural three-part series, but also puts in front questions about perceptions regarding good vs evil. 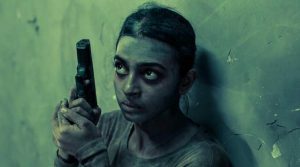 Radhika Apte has played the role of Nida Rahim, who is an interrogating officer in a special cell of Indian Military. After becoming graduate, she is sent to Meghdoot 31 which is a remote military interrogation facility in an obscure place. She was asked to join the force to interrogate latest prisoner Ali Saeed, played by Mahesh Balraj in the series. The facility is commanded by Colonel Sunil Da Cunha played by Manav Kaul. The Colonel has tremendous faith over Nida even though other lieutenant like Laxmi Das questions regarding Nida’s religious entity. Nida is an idealist and loyal officer that have even turned her father, a philosophy professor, to the police for sweeping ideas and teaching students those things that are not a part of their syllabus. The story is based on one single night when the facility gets Ali Saeed who is the leader of a terrorist group and has been responsible for recent murders. Colonel Cunhas’s army have got 24 hours for interrogation where they found that Ali was a tough nut to be cracked. It is when Ali becomes mum and Nida realises that he is not the one they are looking for and has no role in killings. Instead, Gul is out there who has done all wrong and since no one have seen his face, various suspects are blamed for last kills. With the progression of night, things turn out to be gruesome where the prisoners are let loose by the officers. The officer’s anxiety turns situation more intense where everybody turns against each other and the darkness in the cell comes chasing them. The thrills shown and actions set in abundance in first two episodes will make you feel goose bumps in stomach. The director has wonderfully played with darkness where you cannot stop watching while taking precautions not to get scared the hell out. Even if you know that something is fishy, the calmness shown creates suspense where havoc can take place any time and at any second. Since this series is Phantom Films production, it consists of solid actors. Radhika is a perfect fit for the role of straight forward cop and suits in the character of Nida Rahim. Her ideals are clear along with her pains. She has always been a formidable actor who slips into different role with mush ease. 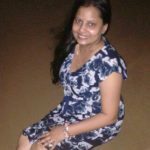 Her latest Lust Stories is a perfect example where she is seen in totally different avatar. Manav Kaul, who plays as a troubled wife-beater and an alcoholic colonel shows his vulnerability in character and the role is played by the actor very sincerely. Other actor like Mahesh Balraj speaks in bulk with blank and stony gazes. He is one of the spookiest characters in the series and his performance has been boosted through a strong screenplay by the director himself. However, some flaws can be seen in the series in which much of the culture is adopted from western countries including the entire set that does not look like an Indian cell at all. This may be because the story is based on future possibilities. Nevertheless, for the sake of the series, the makers borrowed heavily from western thrills. According to Patrick, Ghoul is a result of bad dream that he had one night. But, ultimately it changed into a supernatural horror thriller. The series gives a strong message about how the future would look where rationalism is considered a plague. Whether you are a nationalist or anti-nationalist, it gives deep message regarding the society we live in.